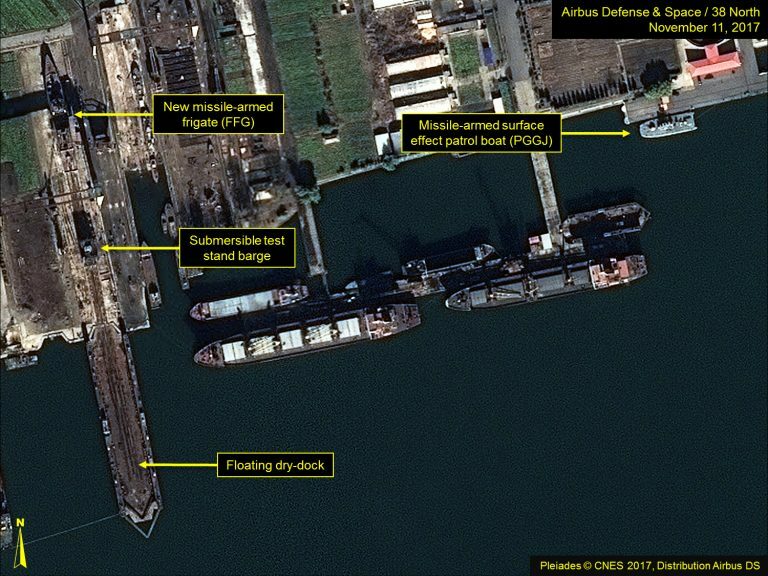 Commercial satellite imagery from November 11, 16 and 24 show that North Korea’s second submersible ballistic missile test stand barge—a platform that allows for underwater missile launches outside of submarines—located at the Nampo Navy Shipyard is being prepared to enter service, a strong indicator that Pyongyang is advancing its submarine-launched ballistic missile (SLBM) program. During this time, the barge was moved from the construction way and berthed alongside the nearby fitting-out dock. This is where vessels are positioned when their hulls are sound yet require systems (e.g., pumps, electrical, communications, etc.) to be installed, modified or repaired, or to have minor work completed on their superstructures before becoming operational. Once in service, this barge will help facilitate a broader SLBM testing regime and potentially establish a SLBM capability within the West Sea Fleet. Figures 1-3. 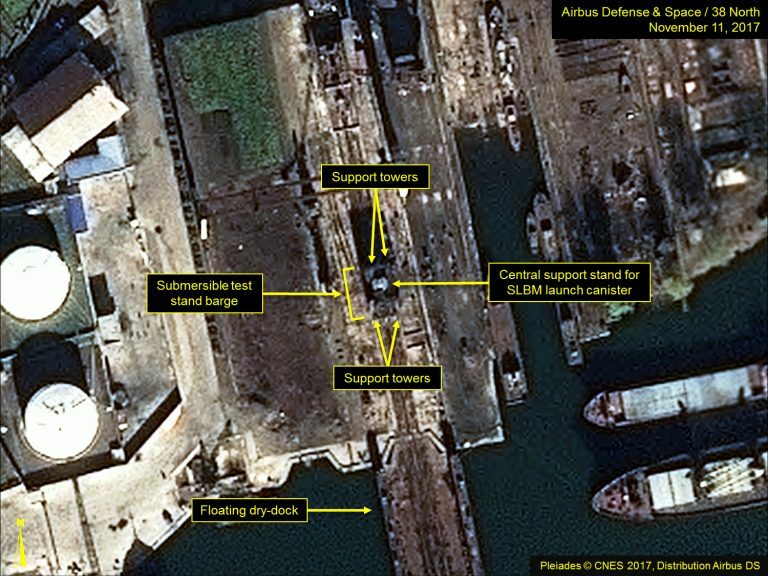 Overview images of Nampo Navy Shipyard show movement of test stand barge in November. In our September report, the test stand barge at the Nampo Navy Shipyard was positioned on the construction way and appeared to be undergoing work on its hull. 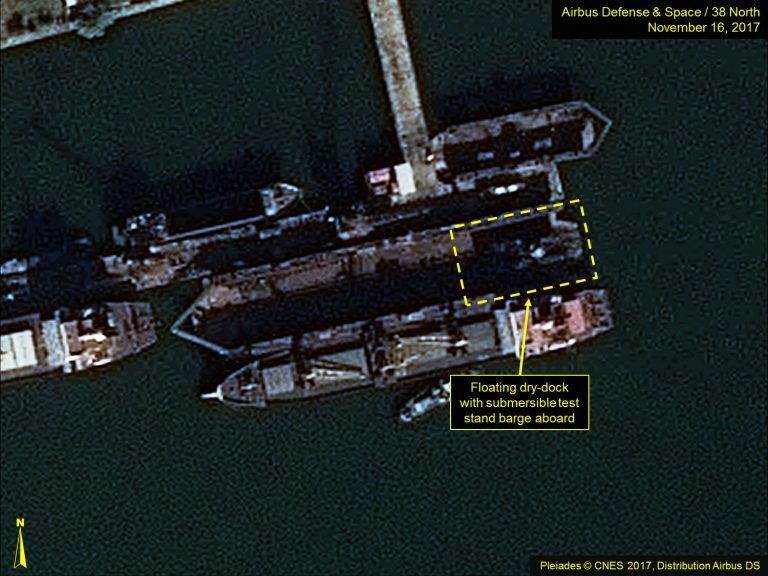 Commercial satellite imagery from November 11 shows that the portal crane previously positioned over the barge has been moved, a prominent tarp has been placed over the central SLBM canister support stand and a floating dry-dock (126 meters long) has been positioned at the end of the construction way in preparation for loading the barge. 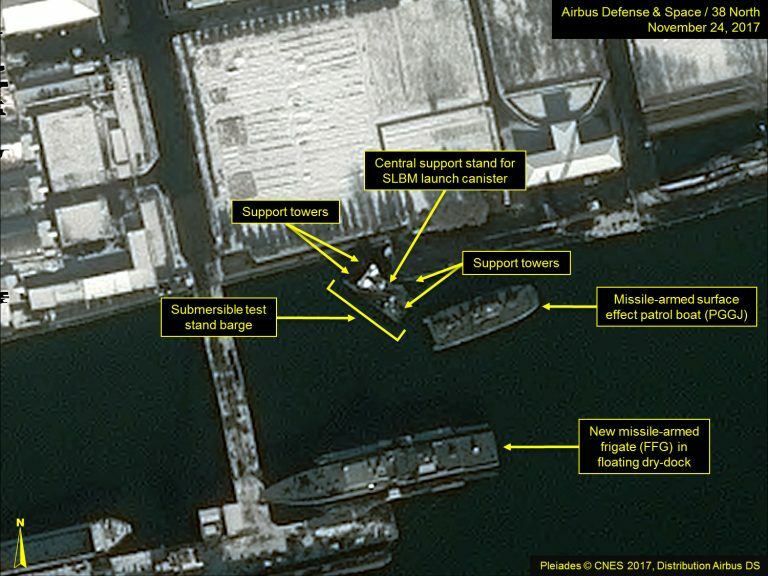 Located forward of the test stand is one of the four vessels acquired by North Korea during 2013-2016, which are being converted to missile-armed frigates (FFG). 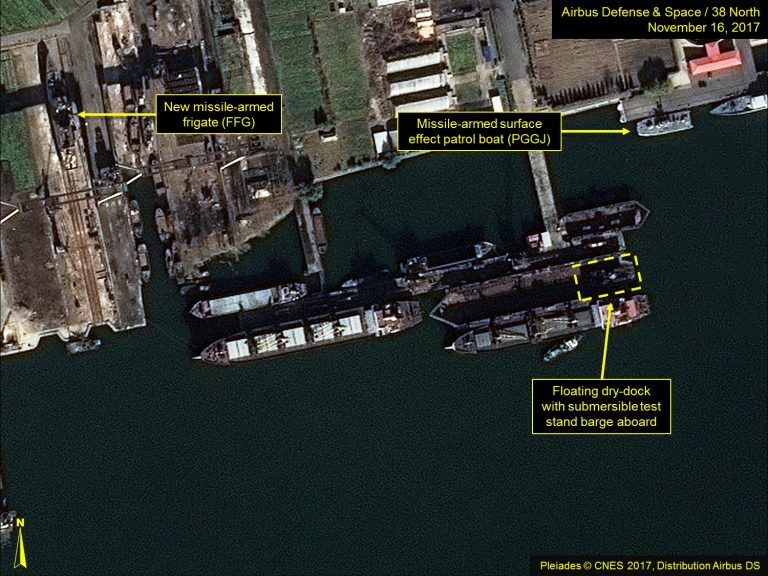 In imagery from November 16, the floating dry-dock, with the test stand barge aboard and at its stern, has been towed a short distance to the adjacent T-head pier with the tarp over the central SLBM canister support stand still in place. By November 24, the stern of the floating dry-dock was awash and the test stand barge had been floated off and was being positioned at the shipyard’s fitting-out dock. This is where vessels are positioned when their hulls are sound yet require systems (e.g., pumps, electrical, communications, etc.) to be installed, modified or repaired, or to have minor work completed on their superstructures before being placed into service. The tarp over the central support stand appears to have been partially removed and what appear to be tarps have been draped over two of the barge’s support towers. The exact nature of the fitting-out work that will be undertaken on the test stand barge is unclear, as is the date when it will be completed and can be placed into service. Figures 4-6. Close-up views of test stand barge throughout November. The first submersible ballistic missile test stand barge was acquired during 2014 and is based at the Sinpo South Shipyard. This barge supports the development of the Pukguksong-1 SLBM and the SINPO-Class experimental ballistic missile submarine (SSBA). Both barges appear to be identical in size (~9 meters-by-22.5-meters) and are very similar in size and layout to the old Russian PSD-4 test stand barges. 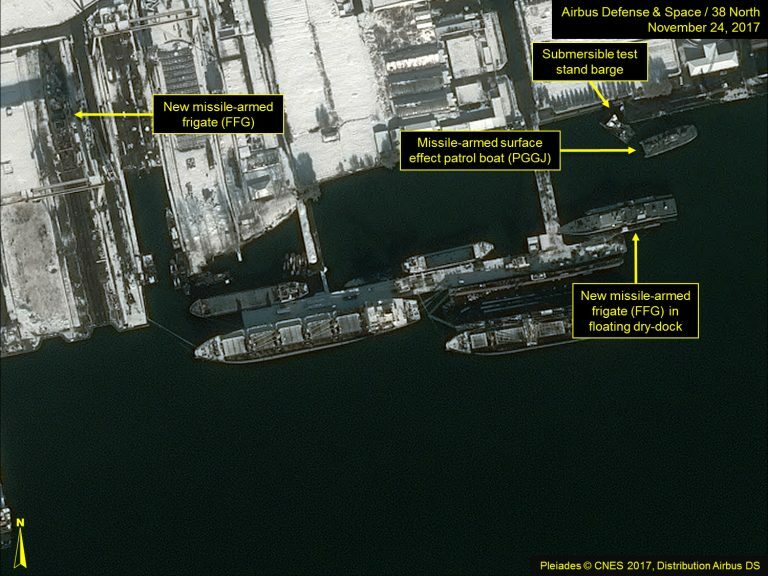 Previous assessments that these four vessels had been constructed within North Korea appear to be incorrect. The best currently available information is that they were acquired from abroad—possibly as scrap.